Please choose the best way to brew according to the type of tea to bring out its best taste and aroma. One teaspoon (3 to 5 grams) per tea cup is a general rule, but you can adjust as you like. 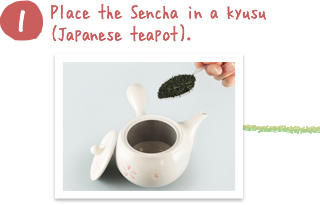 Pour boiling water into a yuzamashi (a bowl-like tea utensil) to let it cool down. You can also use tea cups for this purpose. Pour just enough of the cooled (approx. 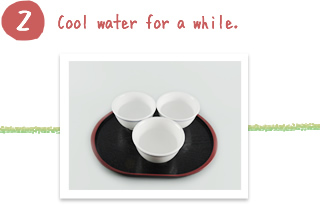 70 ºC) water into the kyusu to fill the tea cups that you will serve. Let the tea disperse for about 30 seconds. 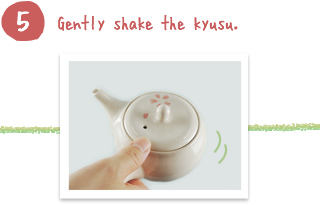 You can shake the kyusu gently to extract the tea quickly. Fill each cup little by little and evenly. 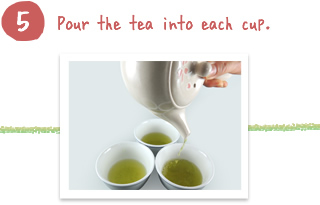 There is an order for pouring the tea: cup 1 – cup 2 – cup 3 and then 3-2-1. By pouring into each cup little by little, the tea is evenly distributed so that the amount and strength of tea in each cup is equal. 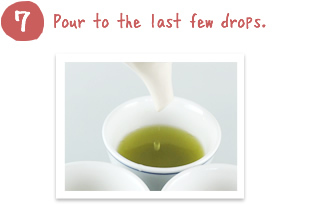 The strongest taste of the tea is concentrated in the last few drops. If tea remains in the kyusu, the next pot of tea will be bitter. You don't need to cool water for Hojicha and Genmaicha. 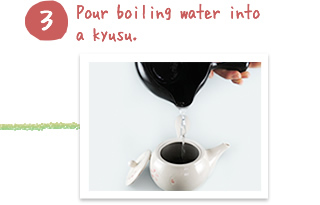 Pour boiling water directly into a kyusu. 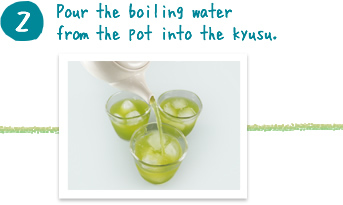 If you don't have a yuzamashi, you can use tea cups to let the boiling water cool. 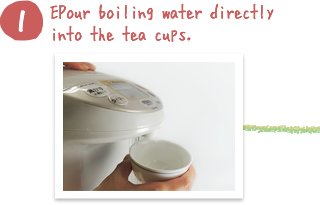 Pour boiling water into the tea cups that you will serve to about 80% full. 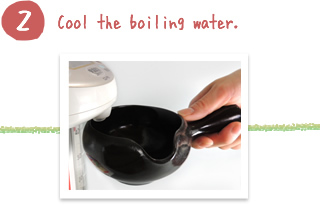 The temperature of the boiling water will fall while you are doing this. 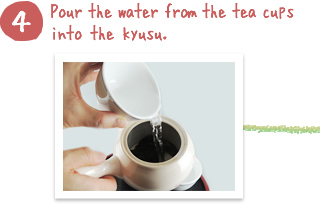 Pour the water cooled in the tea cups into the kyusu. 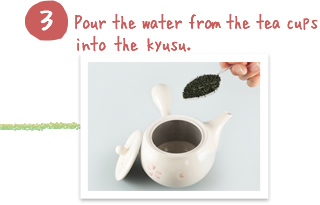 Shake the kyusu gently to extract the tea leaves quickly. Pour the tea into each cup little by little in turns. 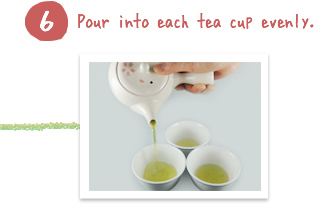 Pour a little tea into one cup at a time in the order of 1-2-3 and then 3-2-1. In this way, you can make the amount and strength of the tea even. Place a few more tea leaves into the kyusu than usual. Put some pieces of ice into the glasses and pour the tea. 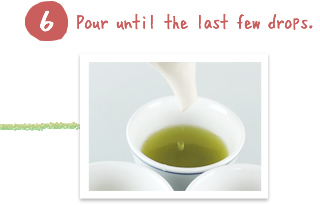 Pour the tea into each glass little by little in turns just as you did for Sencha to make the tea even. Please adjust the amount of tea leaves as you like. Extracting the tea by shaking the bottle with a little water first is the key to making delicious tea. 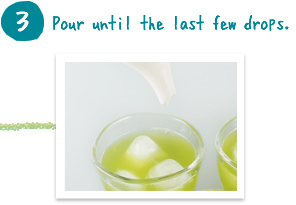 Please drink within the same day. Use fancy glasses to make tea time a little bit out of the ordinary. Use 2 x 5g tea bags for a one liter bottle. 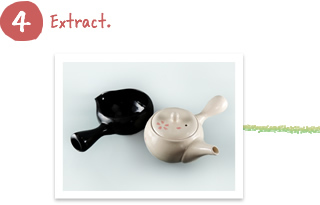 Extracting a strong tea in a little water first is the key to making delicious tea.